Welcome back everyone. Several months ago I wrote a piece about out of print games. I shared the link on several Facebook groups and got a lot of responses. Enough to write a follow up piece. One of the persons kind enough to respond was veteran games designer and writer Gav Thorpe. After the interview with Tim Kulinski (author of the Legends of the High Seas rules) I wondered if Gav would also be interested in doing an interview as well. He kindly agreed. (Which left me with the task of coming up with some decent and interesting questions for a well known person in our hobby, not an easy task I realized). But here goes. When I started in the miniature and gaming hobby (somewhere halfway through the nineties) I had no idea what I was doing. Other than the fact that I liked the Skaven models from Warhammer Fantasy and I knew of a store where I could buy them. Initially I had no interest other than to collect the models. But the hobby is a tricky one as we all know and one thing led to the other. I bought rulebooks and models from other armies as well. I also started reading the White Dwarf magazine. These days mugshots of several people reappeared monthly alongside articles and battle reports. One of those was of Gav Thorpe (remember the long hair and thoughtfull expression?). So Gav, How did you come to be involved in Games Workshop? In other words; how did it come to be that we were faced with your picture every month? 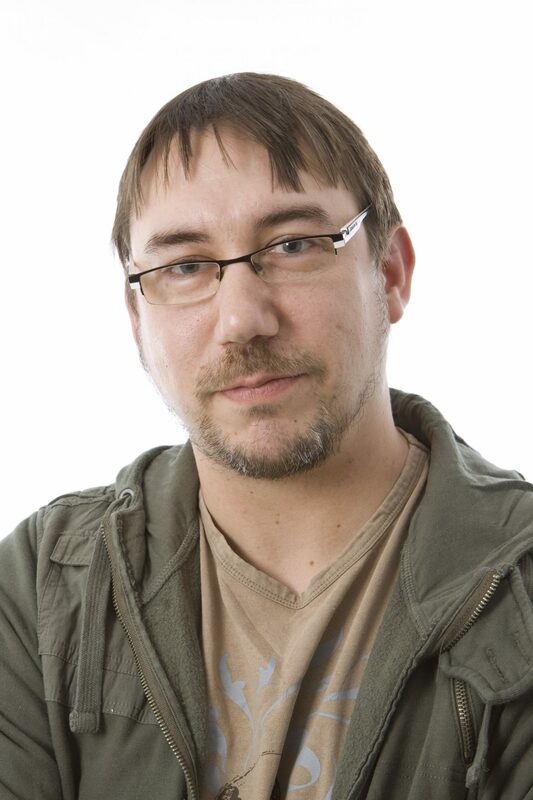 Gav is known for his considarable contributions to the Warhammer 40.000 game, Warhammer Quest, Warhammer Fantasy Battles, Gorkamorka, Battlefleet Gothic, Epic 40.000 and of course Inquisitor. Several of these games are long time out of print, but still have a large following. It must feel nice to know that there are still so many people playing the games you helped create. Do you tend to follow any of the communities that have evolved around some of these games? When I wrote some thoughts on out of print games, one of the responses I got was that a lot of the rules created back in the day are by now surpassed by better game mechanics. (A much heard complaint is that older GW game systems tend to be bloated and involve a lot of waiting for your turn.) 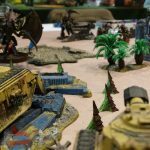 Do you feel that game design has evolved so much that rule systems like the original Necromunda and Inquisitor have become somewhat obsolete? It seems that Games Workshop has also picked up on this idea when we look at the Age of Sigmar rules and the new 8th edition Warhammer 40.000. It might also be the case for the new release of Necromunda. Do you follow the progress of these rule systems? Some of you might not have read the initial post and all the responses to the ‘out of print’ piece. In short I stated that these games are still very much enjoyable once you have a solid base of players in your vicinity. The games do not need the full backup from the producer or regular features in magazines when you have some creative souls in your gaming community. What were your initial thoughts on that Gav? And do you still play any of these older games? “Establishing a community is the key to any game’s longevity. The old Specialist games are starting from a broad base simply because of Games Workshop’s reach, so even though they have always been smaller (in terms of player numbers) than Warhammer 40,000 or Warhammer, that’s still a bigger player base than most highly successful games today. I also think that there is a generational aspect to this. In games as in most areas of entertainment and media at the moment, old is new again. Those of us in our teens and early twenties through the nineties when GW really hit its stride are now of an age when we have the income (if not the time) to enjoy our hobbies again. Many of us have families, and introducing the kids to gaming – especially via nostalgic classics that were so important to our own inductions – is part of that process. But to the general point, most games need releases and support to gain traction, especially if newer, shinier rivals come along. 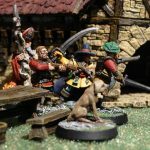 In the absence of that it requires a dedicated community, so the likes of NetEpic or the Blood Bowl scene, to fill the gap – and quite often third party miniatures. The actual fact is that although GW released no new miniatures for a long time, other manufacturers filled the void with 6mm SF models, fantasy football figures and so on. 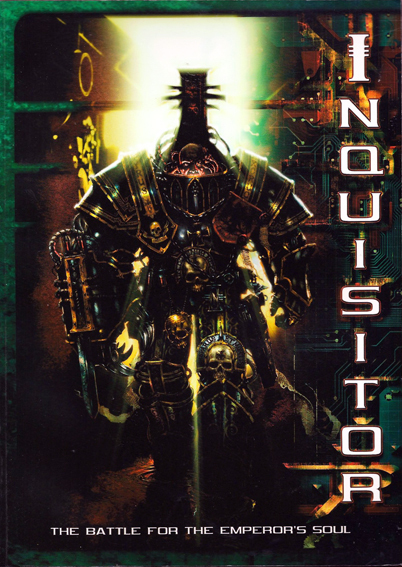 I think the most notable game with your name all over it is Inquisitor. How did that all get started? Together with Necromunda and Bloodbowl it is a game still being played by a large number of people. 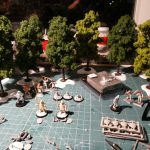 Eventhough most people have abandoned the 54mm miniatures and replaced them with regular 28mm ones, the game mechanics used are still the same. What, in your opinion, is the reason for this devotion to these games? Why are these still a big favourite while others have a much smaller fanbase? “I think I touched on it a little earlier, about the size of the GW customer base all round meaning that in any group you’ll get really dedicated fans. But I think it depends on each game. For Necromunda it is definitely the IP – the imagery and story that came with it. There have been lots of skirmish games from other companies since, but battling out in the Underhive holds a special appeal. For Blood Bowl I think it is simply the amazing games system Jervis Johnson designed. As I said, other manufactuerers have made models, but no other game plays better than BB. 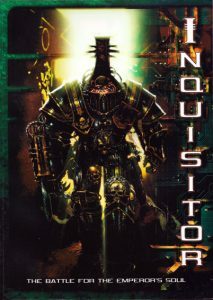 Inquisitor is the perfect blend of RPG and miniatures, allowing converters and painters to go crazy and explore the universe, as evidenced by the great Pilgrymme project showcased by John Blanche, for example, and the storytellers that want to do the same with scenarios, character backgrounds and narrative. 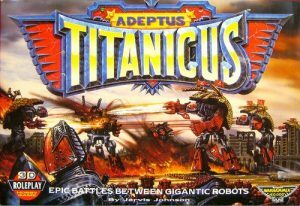 Epic has continued on the basis of the scale – even with Forge World releasing Titans it’s still the only place to really play the massive battles portrayed in the art and novels. Another thing that I find curious about Games Workshop games is that, even though a lot of people can gripe a lot about certain decisions made by the company, there remains a big fanbase. I also can get quite upset when I feel that for the umpteenth time a new codex appears with rules that are so much out of balance that you start to wonder if it was playtested at all. And over the years the ardent hobbyist could find loads of other complaints. But I still enjoy putting my Tallarn on the table. Even when other companies release games which could easily be used as substitues a lot of people stick to the Warhammer Games. Do you think this dedication can be purely put to the extensive background and lore involved in these games that people have enjoyed all these years? Would that make them so reluctant to switch to alternative systems who might even have started out with some elaborate background story. “I think there are several reasons that people stick with, or come back to Games Workshop. 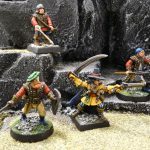 For many people Games Workshop is their introduction to the world of miniatures gaming because of the accessibility of high street stores. The fond memories you have of designing, buying, painting and playing your first army, can really stick with you. 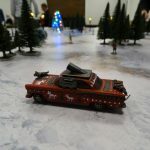 The sheer scale of Games Workshop, and the numerous army factions and personalities, means there’s something for everyone to connect with, and because there are so many players, it’s easier to find gaming buddies. And of course the expansive history and lore is important to many players – it brings the tabletop to life. It might be true for Warhammer Fantasy. Since the original setting was broken in pieces (quite literally) and was turned in the new Age of Sigmar game there was a lot of people who detested the idea that the Old World was now gone. Whole army types disappeared and the surviving ones got a new look and feeling. As far as I can tell it made a lot of players switch to Kings of War for example. What are your thoughts on this? Does AoS have more competion from other games because people need to adjust to new lore anyway and then start to compare rule systems? You have been involved in a lot of games design-wise. Not only tabletop games, but some computer games as well. Seeing the extensive list on your website raises the idea that you must be somewhat succesful in that business. So what makes a person a good games designer in your opinion? Another thing you are well known for is the vast number of books and stories you wrote for Black Library. You were also very much involved in writing lore for the various Warhammer games. Do you prefer writing (background) stories over games design or vice versa? The lore and backgrounds for both Warhammer (now Age of Sigmar) and Warhammer 40.000 are in constant motion. As a writer for Black Library it seems to me that is crucial that you keep up with all the new things happening and, in some instances, changes made to the existing lore and ‘history’ of these settings you are writing your stories in. Do you get a heads up on these things before the rest of us do in order to keep your work up to date? Did you for instance know beforehand about the little revival party by a certain Primarch in Blue? Not everything you do (or have done) is related to Games Workshop. You have been involved in the Cutlass! ruleset for Black Scorpions (Hurah! Pirates!) 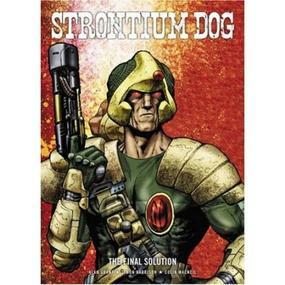 and will be working with that other GW-veteran Andy Chambers on Strontium Dog for Warlord Games. When you have done so much game designing do you sometimes find yourself (unconsciously) copying some of your older work? And if so, do you try to completely re-write this or rather adapt it to the new game? You seem a very busy man. Do you still have time to play games? And what would be your favourite nowadays? And as a final question; are there any future projects where you are working on that you think we would all need to look forward to? “On the gaming front I’ve been writing a new miniatures game which has the working title of Big Stompy Robots https://gavthorpe.co.uk/games/big-stompy-robots/. You each pilot one mech, and use a system of cards and dice to track the energy flow, damage and so on. If your readers are interested in finding out more, I have a very sporadic newsletter specifically for the game https://gavthorpe.co.uk/big-stompy-robot-newsletter/. On the writing front, I’m taking some time this year to finish an original fiction fantasy novel following the exploits of an inhuman assassin that inhabits a magic-saturated city (I call it spellpunk because everything is -punk these days). It’s something I’ve been working on for a number of years, but it keeps getting put aside for commissioned work. There’s always a constant flow of Black Library work too. Just as Ghost Warrior is being released, my first aeldari novel, I’m starting work on book two, Wild Rider. And I still have another two novels coming out before people will see it! Well, that’s it from Gav. I would like to thank him for the time to answer these questions. If you have any comments feel free to leave them below. Mr Thorpe should have some more respect for the original Warhammer,it wasnt just a merciless mining of archetypes, look at the new setting: what’s really original and not taken from Warhammer fantasy?